Celebrating holidays is always a time to tap into old family recipes and enjoy great food with the people you love most! Holiday lore is both fascinating and widely misunderstood. While writing a blog for Fox News, I received an email from a reader that gave me the idea to write about holiday misconceptions. 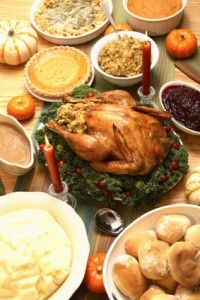 Is Turkey day your favorite holiday of the year? According to this NPR article, turkey wasn’t served at the first thanksgiving, “the Wampanoag guests brought five deer with them” — so venison was on the menu. The English brought fowl, “probably migrating waterfowl like ducks and geese.” In fact many other Thanksgiving Day’s foods weren’t served originally but made it into the traditional meal later on, such as potatoes and pumpkin pie. The American Easter celebration is an interesting mix of Christian religion, fantasy, and has roots in pagan celebrations as well as a celebration of the start of spring. This fun and highly celebrated holiday includes delightful foods such as eggs, chocolate, roasted hams, and specialty baked breads. Since Easter is built on myths, legends and a mix of so many religious traditions that you can’t really trace its origins, there is no firm misconception to point to! Enjoy the melting pots of tradition, and welcome in Spring! During the Christmas holidays, many Italian American families include the “Feast of the Seven Fishes” as part of their holiday cooking tradition. It was originally based on breaking lent and feasting on seven varieties of fish, but why seven? The number “7” considered to be an auspicious number, seven being the most repeated number in the Bible and appears over 700 times. But the traditional fish fest is somewhat different from its origins, it’s “amped” up so to speak in two ways: they serve eleven or thirteen different seafood dishes and include an wide array of seafood including shellfish. Dressing up for Halloween dates back to a Celtic tradition: “dressing up as demons was a defense mechanism” to ward off evil spirits. But trick or treat has nothing to do with the original practice of dressing up. The practice of dressing up and performing for treats was likely brought over from Scottish and Irish traditions for poor children and adults looking for ways to ward off hunger instead of evil spirits. The “candy or mischief” tradition started later around the 1920s where children would threaten naughtiness instead of performance (like the Scot/Irish tradition) for their ghoul’s day booty.